At Firestone we understand that as an owner or driver of a light truck, you have to be ready for all types of jobs: frequent short runs, longer hauls, stop-go deliveries and constant manoeuvring, day after day. For this type of heavy usage you need a tyre that gives you outstanding fuel economy and wet grip1, with the durability to stand up to intensive daily use. That’s why Firestone has developed new-generation Vanhawk 2: to help you get the job done on time and on budget. 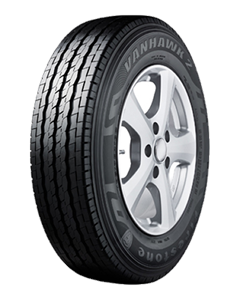 For Vanhawk 2 we have kept the renowned durability and wear life of Vanhawk – two of the reasons why van owners keep coming back to us – but significantly improved wet weather handling and fuel economy. The result is a tough versatile light-truck tyre that gives you total confidence on the road, whatever you have to put it through. …We’ve upgraded the pattern design to achieve EU label B grade (A highest, G lowest) in wet grip.2 Most other light commercial vehicles’ tyres don’t even get close to this level of wet weather control. … And more good news, we have retained the robust Vanhawk construction and long wear life. So Vanhawk 2 will stand the test of intensive commercial use and keep on performing day in, day out. Van owners know that if a job’s worth doing, it’s worth doing well. With the robust and versatile new Firestone Vanhawk 2 tyre on your light truck, you’re already half way there! Firestone Vanhawk 2 is now available from reputable tyre dealers across Europe in 20 popular sizes and will be available in 2 additional sizes in the second half of the year.